If you are new to vaping or tired of the same old flavors, how do you choose an e-juice you like? Though you can listen to recommendations from others, choosing the right e-juice depends on your own taste and smell preferences, nicotine level desired, the e-juice’s PG/VG (propylene glycol/vegetable glycerin) ratio, as well as on the atomizer you are using. Some people choose a particular e-juice simply based on an entertaining vape juice name. To prevent yourself from wasting money on juices you aren’t going to enjoy, we’ve put together this handy guide on how to choose an e-juice you like. Vape juice flavors come in mint, tobacco, sweet, savory, tart, and everything in between. If you are a former cigarette smoker, you may enjoy a tobacco flavor. Or, if you smoked menthols, you may enjoy mint or a mint-tobacco mix. Candy fiends often mix fruit flavors or mix tart with sweet. Whatever your taste preferences, there’s a perfect e-juice out there for you. Come sample at our stores before you buy to see what flavors you like. Another good option is to sample e-juice from your friends when they have flavor you might like. The name of the juice, in combination with its smell, can usually give you a ballpark idea of what you’re getting. 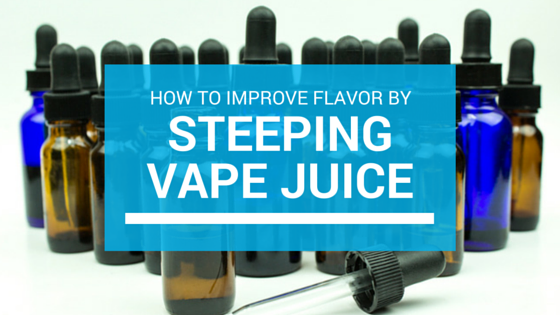 To get an even better idea, find out the juice’s PG/VG and nicotine levels. Most premium e-juices are a 30/70 PG/VG blend. Many customers choose a 50/50 e-liquid blend, especially beginner vapers. To find an e-liquid you’ll really love, though, you will need to consider how much nicotine you want or need in your e-juice, too. Like PG/VG content, nicotine levels will affect the flavor and feel of vaping. To ensure you get the most out of your vaping experience, ensure your vape juice has either no nicotine or nicotine levels appropriate for your comfort level. We always recommend that those purchasing e-juices with higher nicotine levels sample in-store before they buy. Taste buds differ, but most vapers agree that higher nicotine levels in vape juice can add a bit of a peppery flavor. Nicotine can also enhance the sweetness of some e-juices, since the nicotine is sweet in and of itself. Some manufacturers may even add sweetness to higher nicotine e-juices to compensate for the peppery flavor. Higher nicotine content will also give you more of the deeper “throat hit” that cigarette smokers experience. Lower or no nicotine will give a smoother vaping experience that may be easier on the throat for beginners. If you do choose an e-juice with nicotine, generally, a lower nicotine content is a better choice if you vape all day, and higher nicotine level juices are more appropriate for an occasional vape. Atomizers, (tanks) contain coils where residue from e-juice can build up over time. Changing coils frequently can get expensive, besides the inconvenience. It’s just as inconvenient to have to constantly clean your coils. Before buying e-juice, find out if the juice you’re considering is appropriate for your atomizer. New vapers generally choose devices with MTL (mouth-to-lung) atomizers. Thinner e-liquids with 50 percent or more PG tend to provide a more satisfying experience for those using MTL (mouth-to-lung) tanks. As mentioned earlier, sub-ohm users will want to opt for a higher VG liquid for maximum vapor production. How much you enjoy vaping depends primarily on choosing the right e-juice. How to choose an e-juice you like depends on a variety of factors. The most important, of course, is the flavor of the juice. The levels of propylene glycol and vegetable glycerin and nicotine can affect flavor, too though, as does level of heat applied during vaping. PG/VG and nicotine levels are usually included on e-juice labels, but, if in doubt, ask. For maximum vaping satisfaction, though, it is always best to try before you buy. For further information on how to choose your e-juice visit us at one of our Pennsylvania stores. We are also happy to answer any of your vaping questions online. Shop our large collection of ejuices here. New to our store is the Wismec Reuleaux RX200S designed in partnership with Jay Bo. This box mod builds off of the success of its predecessor, the RX200, by integrating a powerful 200W chipset that gives the user all sorts of power. Let’s take a look under the hood. From a user-friendly standpoint, the Wismec Reuleaux box mod checks off all the boxes. Its oversized, 0.96” crystal-clear display has a switchable battery indicator so you can easily choose percentages or swap over to the temperature of coefficient (TCR) mode for more temperature control capabilities. There are also modes for nickel, titanium and stainless steel coil setups depending on your preference. Looking at output, the RX200S houses three 18650 batteries with polarity protection that stops you from inserting the batteries incorrectly and potentially damaging your setup. When you pair that with the box mod’s strong temperature control (200-600 degrees) capabilities, you have more than enough power at your fingertips. If you’ve been looking for a sleek and reliable box mod to update your setup, the Wismec Reuleaux fits the bill. Pick up yours right here and let us know what you think about it in the comments below! Let’s say you bought a bottle of a brand new flavor of e-juice you’ve been itching to try. You open it up, drip some into your setup, take a drag and…it doesn’t taste like you’d hoped. Before you decide the flavor isn’t for you, you should try steeping the vape juice to improve its flavor. So why steep vape juice? By thoroughly mixing your e-juice, the various ingredients will be more evenly blended and taste better as a result. Flavor comes down to personal preference, but the longer you let your e-juice steep, the better it will taste. That means letting the bottle rest for a while before using it. So how tricky is it to steep e-juice? It’s fairly simple to do, and there are plenty of methods. The simplest method is shaking the bottle vigorously to blend the separated ingredients back together. The downside to this method is it can take a while if you’re trying to achieve a really rich flavor. Some people who use this tactic have said they let the bottle sit for days if not weeks before use. If you’re short on time, another simple tactic is putting your e-juice in a plastic bag, placing the bag in a water-filled crock pot, and then turning the pot to the warm setting and checking it every couple of hours. A variation of this swaps out the crock pot for hot water running from the tap. You can also leave your vape juice inside your glove compartment on a hot day and give it a try a few hours later. Whichever method of steeping you use comes down to your own preference and patience, but steeping vape juice helps discover new levels of flavor from the same bottle. What may seem like a weak strawberry-banana flavor today can be steeped and turn into a rich, complex flavor in a few days. Steeping definitely lets you get the most out of your e-juice and find something that fits your palate. What method for steeping vape juice do you prefer to use? Share it with us in the comments below! Cloud chasing has become one of the most popular types of vaping these days, with plenty of enthusiasts looking for that next hot setup that will help them blow the biggest plumes possible. The selection of a lot of components comes down to personal preference and experience, but if you’re looking for vapes that produce the most vapor, here are a few models to keep in mind. A good variable mod gives you tons of control when it comes to your setup’s output. The safety features included are also great for making sure your rig doesn’t overheat or short circuit. Our selection includes starter kits and high-wattage options for beginners and veterans looking for a powerful mod in a compact box. Pair it with a sub-ohm tank and you’re golden. Anyone who likes to customize has opinions about which type of coils they prefer to use for a variety of reasons such as aftertaste and heating capabilities. If you’re going to create a setup with a variable mod, do not use nickel or titanium coils on your mod! Go with organic cotton coils for great taste, vapor production and protection of your setup if you’re changing voltage/wattage output on the fly. A rebuildable drip atomizer (RDA) will help you chase huge clouds, no problem. We recommend one such as 528 Custom’s GOON due to its bridge-style build deck that accommodates nearly any size of build and its deep juice well. If you’re on a budget, the UniCig Mutation X V5 is in stock and features traditional side airflow as well as redirect top airflow systems. Choosing the best vapes for cloud chasing really comes down to personal preference, but as long as your setup features tried-and-true parts and components such as cotton coils, a variable mod, max VG e-juice, a strong sub-ohm battery and an RDA, you’ll be producing huge vapor clouds in no time. What pieces do you swear by when you’re chasing clouds? Share in the comments section below! As the snow begins to melt and give way to warmer weather, more and more people will be taking vacations around the world. For anyone who vapes, that begs the question: “Can I bring my vape on a plane?” We covered this topic a bit a few years ago, but TSA travel restrictions for e-cigs have changed since then, so a refresher is in order. The biggest change to travel restrictions for e-cigs is that battery-powered devices cannot be packed in checked luggage. This is a safety measure in case a device catches fire mid-flight. This doesn’t impact carry-on luggage, however, so you can still carry your vape on your person or in a carry-on bag. Electronic cigarettes and vapes are treated the same way as tobacco products when it comes to onboard use, meaning you aren’t allowed to vape in your seat or in a lavatory. Your vape’s batteries cannot be charged while onboard. When it comes to packing your vape into your carry-on or leaving it in your jacket, make sure the batteries are separated from the device itself for the duration of your travel. This makes going through security checkpoints faster and eliminates the chance of the battery and the device malfunctioning. Store your e-juice like you would your toiletries—in a sealed plastic bag. Don’t store it in your setup’s tank! If you’re ever uncertain as to whether or not a component of your vape is allowed on a plane, check with the TSA. They update their prohibited items listings so you know exactly what is and isn’t allowed. 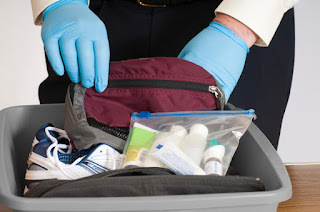 If the TSA’s restrictions don’t answer your question, the airline itself will always have a list of prohibited and allowed items for carry-on and checked baggage. The JoyeTech Cuboid temp control mod is a compatible, compact and powerful TC vaping mod. Using a variable temperature control system with V3.0 firmware pre-installed, this JoyeTech TC mod has a 150W output running off dual 18650 batteries. The JoyeTech Cuboid stays up to date with the changing technology of temp control mods. Its firmware is upgradeable, with a link included on our site to upgrade your output to 200W. The Cuboid is perfect for anyone looking to customize their setup as they go. With stainless steel 510 threading, it can accommodate the majority of larger tanks and it’s compatible with nickel, titanium and 316 stainless steel coils with a customizable TCR mode depending on which material your coil is made of. With a temperature control range from 200–600 degrees Fahrenheit and variable wattage resistance capabilities from 0.1–3.5ohm, you’ve got plenty of options for your output to produce huge clouds. We offer this sleek and powerful temperature control mod for $42.95, a $12 savings off the retail price. You can save even more with free shipping and earn $1 in rewards credit for every $25 you spend! If you’ve been looking to get into temp control vaping with a reliable and affordable mod, you can’t go wrong with the JoyeTech Cuboid. If you want to try your hand at sub-ohm vaping without making a big upfront investment, KangerTech has come out with a line of box mods with a 50W output in colorful finishes and a 510 thread to fit most 510-threaded devices. Their Kanger SUBOX Nano and Mini both provide some great options for new sub-ohm vapers, but have a few small differences. If you go with the Nano line of starter kits, you’ll find boxes with a 7W-50W output range in 0.1 increments for complete control. Each box features protection against low voltage, low resistance, short circuiting and reverse polarity, making them an incredibly user-friendly option for first time sub-ohm vaping enthusiasts. It charges easily with a micro USB, uses one 18650 high amp battery, can hold 3.5ml of liquid, and features 100% organic Japanese cotton coils. We have it available in black, purple and pink to fit your style. The Nano is a great option for anyone who wants the basics without much adjusting to make. Unlike its Nano sibling, the Kanger SUBOX Mini gives you a little more room to modify the box mod to your liking. The Mini can hold more liquid than the Nano (4.5ml total) and has a RBA base if you wish to build your own coils for your mod. It also includes an updated airflow control with dual intakes for a more stable temperature when in use. The battery size and amperage is the same as the Nano, and the wattage output range is still 7W-50W. Try it out in a black/red or black/white combination finish. The SUBOX line of box mods from KangerTech offers great options for new sub-ohm vapers. If you like a bit more freedom to modify your setup, go with the Mini and spend a few extra dollars. If you’d rather let the equipment do the work, the Nano is a perfectly capable option and costs a bit less. What sort of box mod setup do you prefer? Let us know in the comments below!